Hasler, who oversaw the seminar with OFC’s Didier Chambaron, was delighted with what he saw on the ground in Vanuatu. “I was very happy and felt privileged when OFC invited me to come and run this course in OFC and I believe what we all went through and learnt this week will help a players Pathway development in Oceania Football to develop higher,” Hasler says. “There are a lot of children out there in Oceania and what I witnessed and saw in our practical sessions in this one week course proved that if all coaches in every nation work hard and effectively, football in OFC will progress to another higher level. I want to reassure you all that OFC is following the right path to develop football now. “I want to express my gratitude to you for the great hospitality shown to me here in Vanuatu and when I go back I will present a very good report to FIFA. A big thank you to Vanuatu Football for hosting this seminar and thank you to OFC Technical staffs; Patrick Jacquemet, Didier Chambaron and Giovani Fernandez for their contributions in running the course with me,” says Hasler. After Hasler’s speech, Mr Lambert Maltock, the Vanuatu Football Federation President, believes important knowledge will disperse to the confederation’s Member Associations following the conclusion of the seminar. 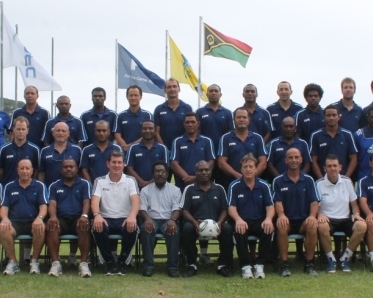 “VFF is very proud to host this very important course and first ever OFC and player Development Seminar in Vanuatu. “I am sure each and every participant of all the Member Associations have learnt a lot on how to develop football from important course instructors like Hanzreudi Hasler from FIFA and the OFC Technical staff; Patrick Jacquemet, Didier Chambaron and Giovani Fernandez. “We must hold hands together and help OFC to build kids football to gain a pleasing result in OFC in the future. “It is also very important for all technical directors to return to their countries and develop better young players to make everybody happy at the end of the day for a rewarding result,” says Maltock. “May I take this opportunity to express my greatest gratitude and appreciation to OFC and FIFA for accommodating this first ever course in our country Vanuatu and I strongly believe that every single participant has learnt and was also inspired a lot in this one week course held at the football academy,” he added.